Will expire September 1st, 2006. 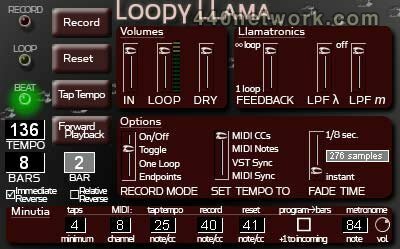 It's a looper... Made to emulate the Jam Man or DL-4 - but also generate a click track so it could be used with a drummer live. It is designed to work with Plogue Bidule for live performance, but it can be used as a regular VST plugin as well. The idea came after seeing a few Joseph Arthur and Howie Day shows...the things those guys can do with looping was facinating to me. But as they both gained popularity they played with full bands and left their experiments with looping behind them....there was no way for them to start a loop and have the drummer stay in time. 2 years later I finished the Loopy Llama. I've used it with drummers, but mostly for solo acoustic and vocal looping and as an interesting reverse effect for recordings. It performs just like many looper hardware units on the market, but with a maximum loop time of 60 seconds. Experienced loopers will recognize "endpoints" mode - where you hit the record button to start recording, and again at the end of the loop. In the other 3 record modes, you determine the tempo before you play by entering it or tapping it in onscreen or with any MIDI foot controller. Once the tempo is set you no longer have to worry about hitting the record button precisely on a downbeat. You can play along to the click track and turn recording on and off whenever you want. You can set the number of measures to loop using a program change or onscreen. In endpoints mode this means how many clicks the metronome will make during the loop you made. If you are recording, hitting reset once will "forget" what you played for one pass of a loop - so if you hit a wrong note you don't have to start over. If it not recording or you hit the reset button twice it will completely reset. Posted by ted warigo on Thu, 04/06/2006 - 18:01.
yo it's the best looper i tried... thanx Chris, i'll bye your soft when it'll be finished !!! Posted by Tyson on Mon, 02/07/2005 - 09:25. I was wondering if there is a program with the same capabilities as fruityloops? I would like to be able to write every note of my own songs from beginging to end using all instruments. If anyone could refer me to something better then fruityloops please do so.